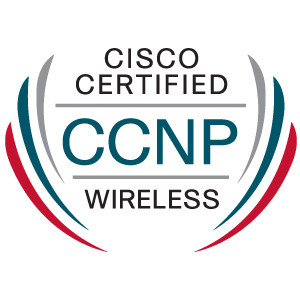 Band Select is Cisco’s terminology for Band Steering. When enabled it encourages stations onto the 5 GHz band. This is achieved by suppressing 2.4 GHz probe response frames to station probe requests and by responding with 5 GHz probe response frames first. You must be wondering why Band Select should be configured. One reason is because 2.4 GHz is dead. What I meant by that is how congested the 2.4 GHz band is. There are only three non-overlapping channels on this band compared to the 25 non-overlapping channels available on 5 GHz. An engineer will have a better channel re-use plan and will increase WiFi performance by using a less congested frequency. Band Select is enabled globally, on the wireless controller, by default. But it does have to be enabled on the WLAN. The feature can only be used on access points that connect to a controller. There are a number of settings that can be configured on the global Band Select section. Probe Cycle Count – A value that must be set between 1 and 10. By default it is set to 2. This sets the number of suppression cycles for a new client. Scan Cycle Period Threshold – Sets the time threshold for new probe requests from a client coming from a new scanning cycle. This value is between 1 and 1000 milliseconds. The default setting is 200. Age Out Suppression – This sets the expiration time for pruning known stations. When a station is aged out and heard again, they are considered new. The default setting is 20. Age Out Dual Band – Sets the expiration time for pruning previously known dual-band stations. After the time passes, stations are considered new. The default setting is 60. Acceptable Client RSSI (dBm) – This is the minimum RSSI for a station to respond to a probe. By default it is set to -80 dBm. Acceptable Client Mid RSSI (dBm) – Honestly, I did not find much information on this setting. I can’t think of what this might possibly be and what Cisco would consider a “Mid” RSSI value. Voice applications are a big reason for not using Band Select. Other real-time applications can also be affected by Band Select. Another reason for not enabling Band Select because roaming will be negatively affected. A station may take longer to roam because of 2.4 GHz probes being suppressed. Do not use Band Select without knowing what devices are being used and what application is utilized on your network. 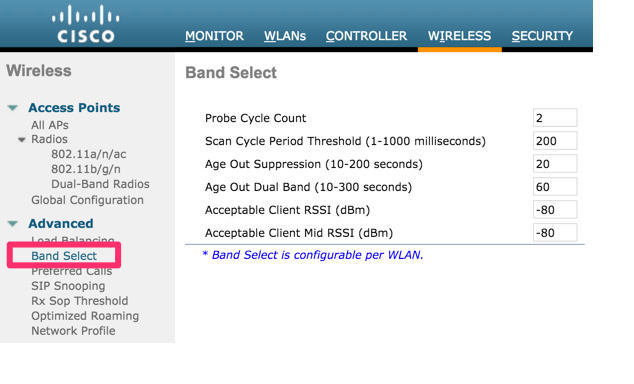 Band Select may have positive affects on your network as long as proper testing and validation is performed. On the other hand, it can cause issues if there was no planning involved. Has Band Select worked well for you? Let me know in the comments below.